Clear vase will be used if blue is not available. 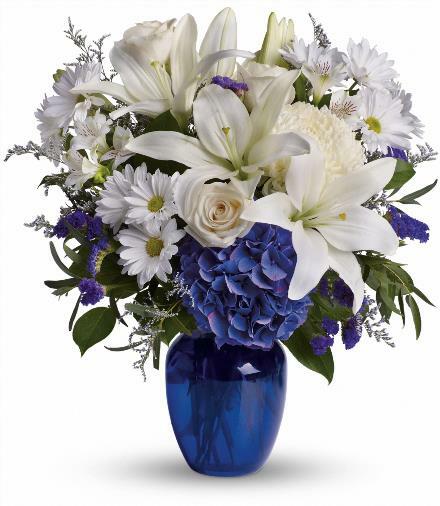 Beautiful blooms such as blue hydrangea, white roses, white lilies and alstroemeria along with white chrysanthemums, limonium and more are beautifully arranged in a dazzling cobalt blue vase.. Featured Floral Selection - Beautiful in Blue. Florist Notes: Blue vase may not be available. If so, the florist will use a clear glass floral vase. Arrangement Details: Could be ordered as a centerpiece also.